Chameleon Youth Hostel offer a range of accommodation suitable for a lot types of travelers. An old fashioned mansion house renovated and turned into a hostel. With dorm style beds for backpackers and 2 fully equipped apartments for those on a budget you are sure to find something on your needs. Just 5 minutes walk from Thissio metro station, Chameleon is in the heart of the old town of Athens, offering the ability to go on foot in most of the ancient monuments like Acropolis. It is also surrounded by cafes and bars providing you the kind of vacation you desire. We wish to create a multicultural environment which is our home and we hope it becomes so for many backpackers throughout the world. Common Rooms Laundry room. Fully equipped kitchen. Living room. Terrace. Playroom. 24h Reception Safety Lockers. Safety box. Luggage storage Accessories Free Wi-Fi. Vending machines. Towels for hire. Tea & Coffee making facilities. Pet friendly upon request. No baby beds. Not suitable for the disabled - no elevator. Hôtel calme, propre, tranquille et surtout très bien situé, à 5mn à pieds de l'Acropole, dans le plus vieux quartier d'Athènes ! Les chambres sont confortables et agréables, les salles de bain grandes et pratiques, la cuisine très fonctionnelle, le personnel adorable. Petit bonus : si le petit déjeuner n'est pas inclus, on vous offre tout de même thé, café et biscuits le matin ! Siamo stati nella cameretta doppia sul terrazzo, che abbiamo trovato molto carina, raccolta e accogliente; bagno spartano e spazioso. Atene è rumorosa notte e giorno, ma la posizione un po' appartata probabilmente attutisce i rumori. Visto però che il terrazzo è un'area comune, in alta stagione potrebbe essere una scocciatura il via vai di persone davanti e attorno alla stanza, anche se dopo le 23 i proprietari vietano l'accesso e assicurano la calma. In bassa stagione una scelta ottima. 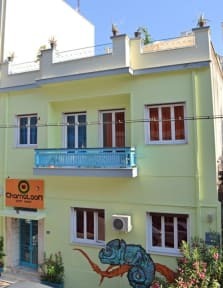 Small hostel in a perfect location, very close to Akropolis! Supermarket and restaurants are nearby. Rooms are big enough and with a small balcony. The road can get a bit noisy also because of the thin windows. The beds are stable and mattresses are good. The staff is very nice and ready to provide any useful information. No breakfast is served during winter!